In all honesty, this is like finding the TAT Communications logo... although unlike that, this isn't cut off at the end! Someone on r/MST3K who was a puppeteer for S11 said they used a mech that you could push up and down and that there were bendable wires inside his springs. Bot Building - General Discussion / An idea: KTMA bot kits! Continuing from what I said here, I have an idea for KTMA bot kits. It will have several changes compared to the regular bot kits: Like Tom having cast replicas of the entire doll arms instead of just the hands, along with pre-cut bowling pins for the shoulders. His hoverskirt might be cast from the two-piece that Bry made or maybe a Kartell stand that he showed us cut down. Tom will also have gaffers tape, with red or black as options. Crow will mostly be the same, but he will not have the second Floralier tray, will come with disassembled Fanny Pincher replicas instead of just the hands and will have a Crown pin instead. His eyes might be replica Gnip-Gnop balls, but considering that the game's still being sold probably not. I think it will be a lot easier to cast the Infanseat used for Gypsy instead of the Infant love seat. If you look at Tom's arms in KTMA you'll notice they're always in that shape, never changing. The doll his hands came from's arms are in a similar shape. Not to mention that if you look closely in this photo, you'll see that a little of said doll's wrists are showing. So my theory is that Joel didn't just use the doll's hands for KTMA Servo, but used the whole arms. And that leads to an idea I have: KTMA bot kits! I'll explain more about that in the general botbuilding subforum. If you want to have some more accuracy, then the arms are smooth in the wrist area compared to the rest of them. I've also noticed this little part in between the neck and head that yours doesn't seem to have. EDIT: After viewing a photo of an unmodified slide viewer in this thread, it may actually be the bottom part of the slide viewer as seen from the back. EDIT2: Disregard the previous edit. Tom Servo / How did they make Tom's arms stay at a static angle for Season 11? With Tom's working arms in Season 11, they are longer and always keep that static bend. If you look in here, you can see that Tom has his longer arms, but they are not at a bend like in Season 11. I presume that there is some sort of PVC pipe or something to keep that bend and the pipe is attached to one of the RC motors to move them. 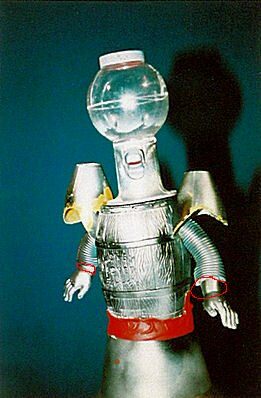 Tom Servo / Re: Easy way to get Snack dispenser or look-alike? So it came today. And guess what? I was sent the wrong kind! I got duped! Just ordered the small head. Will get all the other parts I need soon. That last one seems good, but I'm kind of worried considering most of the reviews are one-star and proclaiming that it's cheap and cracks easily. Tom Servo / Easy way to get Snack dispenser or look-alike? Now, I plan on building some sort of "Mini-Servo" at some point in the future (I already have a small barrel of monkeys as the body) and I would like to know a good and easy way to get the Snack dispenser or a good-quality knock-off, as the snack dispenser itself has been discontinued early this year. EDIT: I found a good one of these here. Unfortunately, they only come in cases, it seems.